Cayla Ames--Enrollment advising assists students with brochures and useful information. Choosing a major and the direction our lives go can be one of the most confusing parts of going to college. At California Baptist University it is possible for a student to change majors as needed. There is not a specific time within enrollment in which a student is required to make a decision. 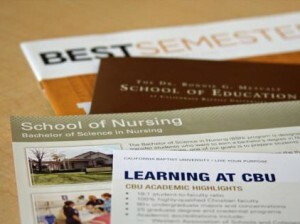 However, when a student enrolls at CBU, they are assigned a specific academic catalog. The academic catalog is a list of current required classes. After five years of attending CBU a student’s catalog will change to the current catalog. This is to ensure that the courses that the student graduates with are current for the career they are trying to obtain. The changes that take place within an academic catalog verify that the student’s required courses are current and relevant, giving the student the proper knowledge for the chosen career field. “Within the last ten years, majors have started to become more fluid as the world has changed faster. The majors have changed faster to keep pace,”Shelly Rupard, director of enrollment advising, said. If a particular major is going through extensive changes in catalog and a student with an earlier catalog wants to switch to the updated catalog, they can apply for a catalog change in the Office of Enrollment Advising. According to Rupard, if a student changes majors often, the Office of Enrollment Advising will discuss cost versus benefit with them. The advisors sit them down and see what interests them. Students should consider what they like to do, what they find themselves thinking about, what types of shows they watch and the details they notice in everyday life. Say a student watches a lot of television shows like “Crime Scene Investigation” and “Criminal Minds” and finds themselves getting caught up in finding the answer. Perhaps the student should consider majoring in Criminal Justice. Or maybe the student always pays particular attention to the design, written messages and articles which appear everyday life, such as newspapers, magazines, banners, brochures, layouts, color schemes and fonts. Maybe the student should consider majoring in Graphic Design and Digital Media, Journalism and Media or Public Relations. “I decided to major in Business with a concentration in Management and International Business. I enjoy working in retail and I want to continue to work in the business world and travel,” Freshman Sarah Gazard said. CBU’s criteria for required general education classes is broad. Therefore, a student has the opportunity to take classes from a majority of different majors. While taking these general education classes, students should look at what classes they excel in and what subjects they enjoy learning about. It is a common myth that the first two years of college are for general education and the later two are for major requirements. However, this is not the case. Students have the same amount of time to get both general education requirements and major requirements completed. Keep in mind that with the rapid change in technology comes redesign of particular majors to keep up with the times. “Certain things go out of style and certain things will come into style, especially with the changes in technology, which is having a drastic effect on how often majors are needing to change their courses,” Rupard said. Getting a fluff degree is a common worry. CBU has carefully considered each major that they offer. With that said, the decision of which major to choose should not be based on future profit. Choosing a major is a difficult decision, so look at your interests, test out different classes, look for a spark, keep in mind that some majors will change with technology and do not worry about making a lot of money. Last of all, pray about it and ask God to guide decisions.